A traditional, charming 2* hotel in an outstanding location, with everything on your doorstep. Hotel Floralp sits just on the edge of the resort of La Clusaz, and is a small, family-run hotel with a chalet-style atmosphere. 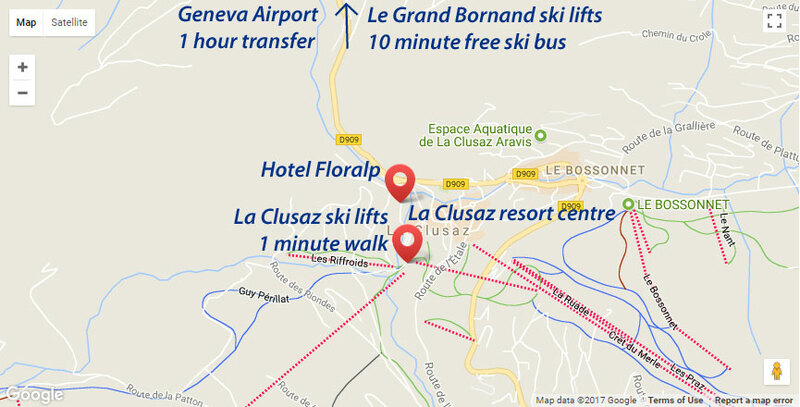 It is perfectly located to enable you to walk to all the facilities in the resort, yet the local free ski-bus stop is also just next door if you want to venture further afield in La Clusaz, or to the neighbouring resort of Le Grand Bornand. 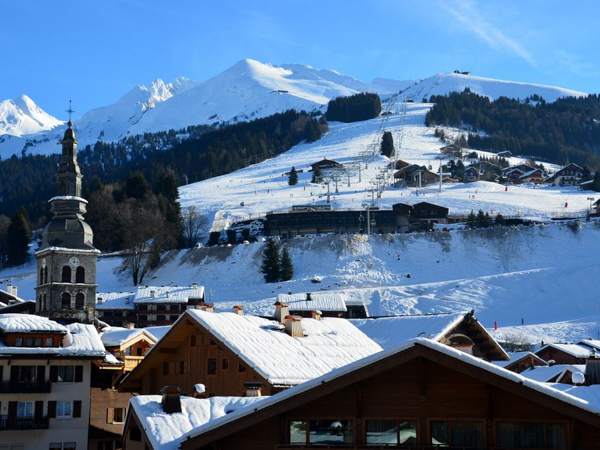 Skiing in the full Aravis area is included in your package, and Le Grand Bornand is only a 10 minute bus journey away. George and Natalie will be your main point of contact during your stay, and are always on hand with exceptional service, advice and knowledge of the local area. 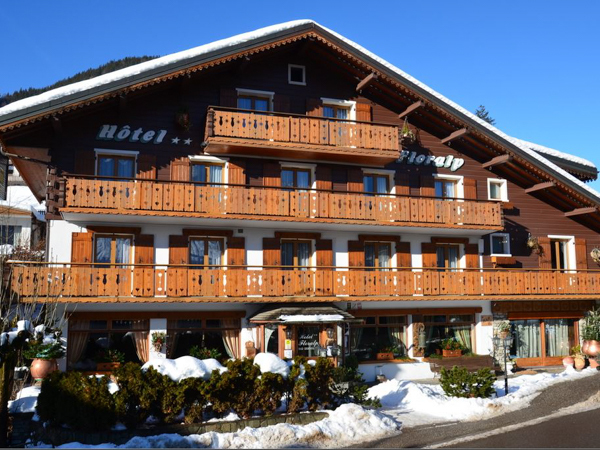 At Hotel Floralp you will benefit from all the facilities that a hotel has to offer, but with more of the warm, sociable atmosphere and charm that you might find in a ski chalet. 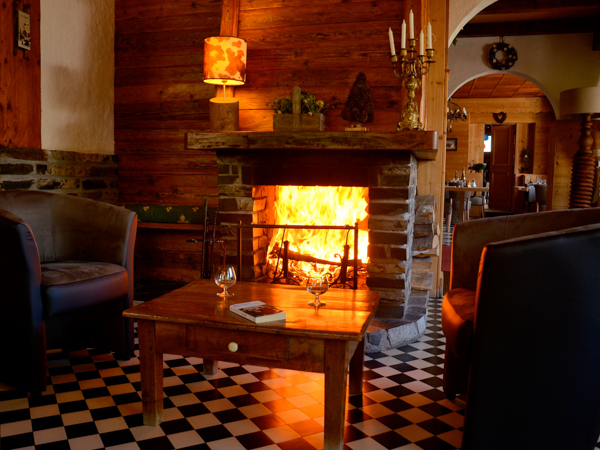 The intimate dining room and cosy bar with its roaring fire, makes this hotel a great place to socialise with fellow skiers. Whether you are in a group, couple or solo traveller, this charismatic hotel has something for everyone. 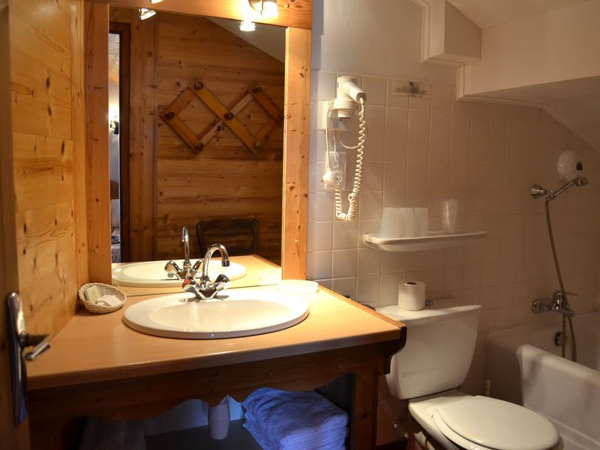 Floralp has 20 ensuite bedrooms, including twins, doubles and some larger family rooms. Bedrooms are located on the first and second floors. 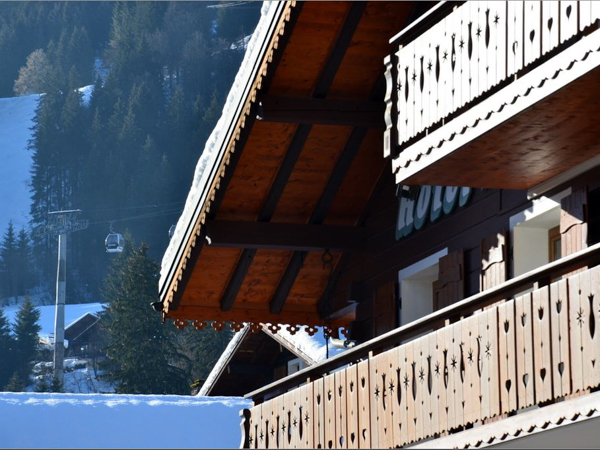 Traditionally decorated in a warm Savoyard style, some rooms have balconies, and those rooms towards the front of the hotel allow sweeping views of the Aravis Mountain chain, that dominate the stunning scenery in La Clusaz. On the ground floor you will find the dining and breakfast room, as well as a very inviting bar with an open fire and comfy seating. It stocks a good selection of beers, spirits and soft drinks. Alternatively, for those blue-sky days, there is a nice sunny terrace to enjoy an aperitif and take in the excellent view over the ski slopes. 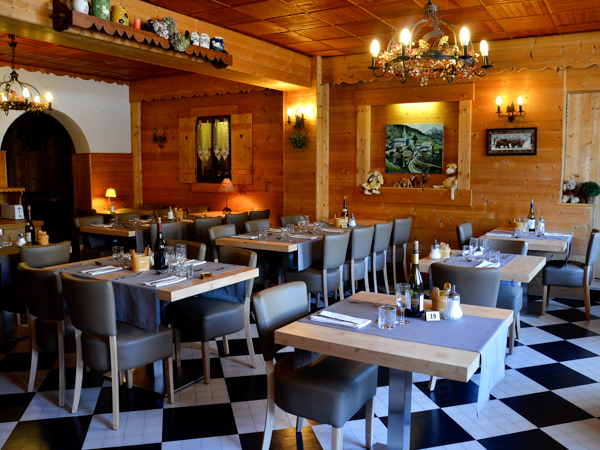 La Clusaz has a lively après-ski scene, and there are lots of restaurants, bars, shops and clubs within easy walking distance. If your ski legs need a break, every Monday morning, in the village square there is a market where you can find locally produced cheeses, cured meats, wines and gifts. Catering is on a half-board basis at Hôtel Floralp, which includes a continental buffet breakfast, plus a 4-course evening meal, including a cheese board and dessert. Their menu comprises traditional local dishes, served in a cosy environment. 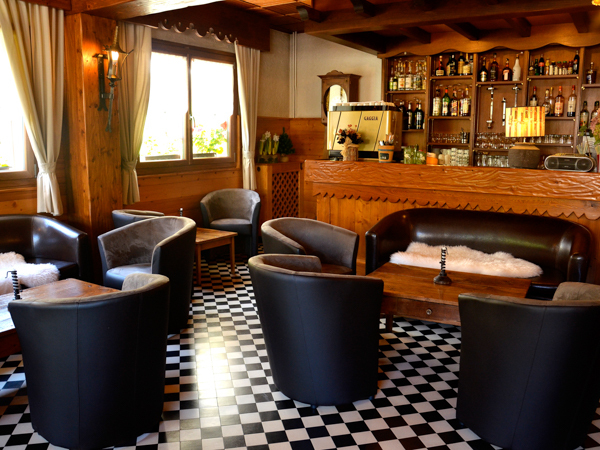 The hotel is located on the edge of the resort of La Clusaz, a 100m easy walk from the main ski lifts. Just an hour’s airport transfer from Geneva, and ideally located next to the main free ski-bus stop, where you can catch regular buses to the neighbouring resort of Le Grand Bornand. From here, you can ski another 90km of piste at no extra cost, as the full Aravis region lift pass is included in your package. The ski shop is only one minute’s walk away, and there are plentiful restaurants, bars, cafes, clubs, ATMs, post office, supermarkets and several ski gear and regional produce / gift shops very close to the hotel – from a few seconds to a few minutes walk. However, we will still be available and easily accessible to support and help you should you require it! Our Ski Reps will be present in La Clusaz on your first evening so you can meet them to ask any questions, or to use their experience of the Aravis resorts. Airport transfers on Lite Packages are included for flights cheduled to arrive into Geneva airport between 1500 – 2115, and for departure flights taking off at 1600 or later. On departure, your airport transfer will leave resort 3 – 3.5 hours before your flight time, meaning an evening flight from about 2000 onwards will let you ski all day on your last day. 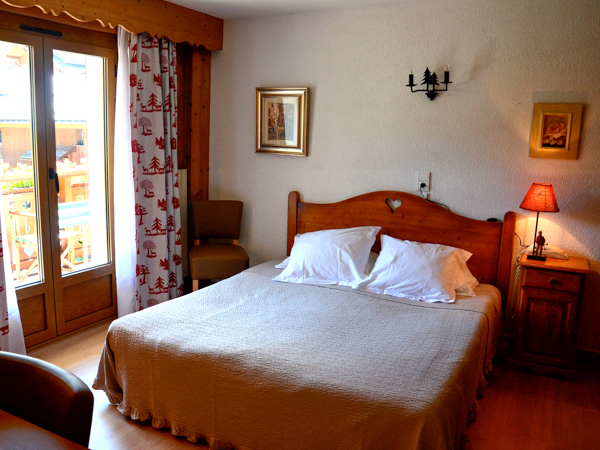 Stays at Hotel Floralp are possible throughout the winter season, from the end of December to mid-April. Stays include half-board hotel accommodation – continental breakfast and 4-course evening meal. All stays at Hotel La Pointe Percée include a full Aravis region lift pass, covering 220km of skiing across the ski resorts of La Clusaz and Le Grand Bornand. Airport transfers are included on standard break start / end dates, for flights scheduled to arrive into Geneva airport between 1500-2115, and depart 1600 or later. Transfer time from Geneva to La Clusaz is just 1 hour. The Ecole du Ski (ESi) are the largest ski school in La Clusaz and they offer private lessons with English-speaking instructors which are suitable for our short break guests. At Hotel Floralp, hire of ski jackets, trousers, goggles and gloves can be pre-arranged. La Clusaz has a good municipal crèche, with places available for children from 3 months to 4 years. Word-of-mouth recommendations are important to us. Click on the TripAdvisor logo to see the many reviews from guests who’ve stayed at Hotel Floralp. Want to stay at Hotel Floralp... ?